While at an art show in February 2010, I decided to take a break and head outside to see what interesting reference material I might find for a future painting. My good friend and fellow artist Julie Bender was up for a break as well so the two of us grabbed our cameras and took to the streets of historic downtown Charleston, SC. I was so entrenched in conversation that I was taking random shots of architecture — anything that looked interesting. I was completely unaware of this particular enticing scene that I had captured. 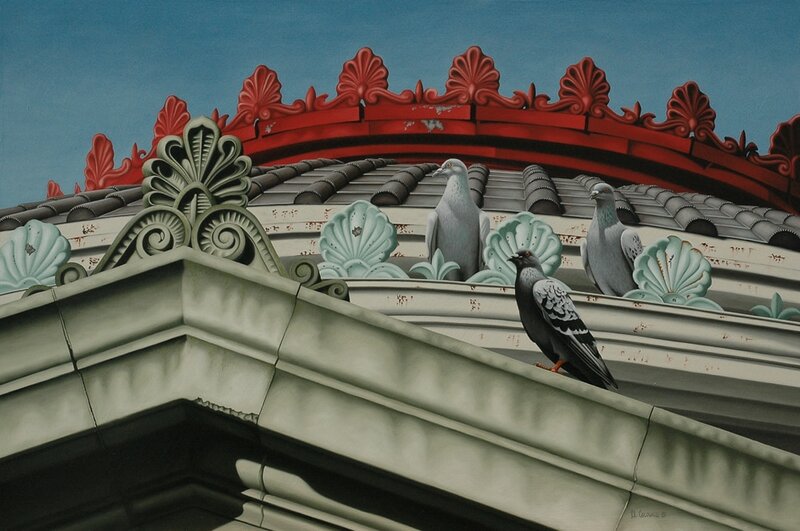 This painting provides a visual buffet of textures and colors — from the red crown of finials to the bronze roof tiles with the highly textured ends to the white-painted metal fascia dotted with specs of rust to the row of tarnished copper green scalloped finials — all topped off with a large stone gable adorned with a dramatic decorative finial and three perfectly perched rock pigeons. Who could resist painting this festive feast?